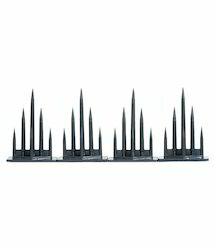 The offered bird spikes are made up of finest UV stabilized poly carbonate plastic using cutting-edge technology. 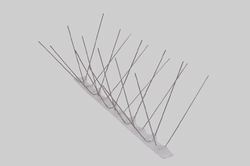 Bird Spikes can be placed easily on building projections, roof ledges, trusses, sign posts, statues and beams etc. 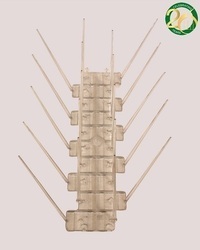 Bird ABS Spike offered comprise anti bird matting spikes that come in high strength finish and feature sharp edges so as to prevent colonization of birds. These come in polyolefin all weather-proof co-polymer finish and can be made available in standard size dimensions. 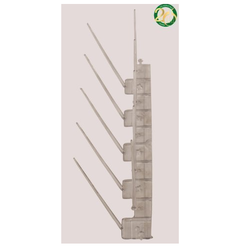 Some of its features include length of each piece of 6.8 cms, width of each piece of 4.0 cms and height of each piece of 9.5 cms; weight of each piece is 20gms ± 5%, sharp edge finish with service life of 5 years, suitable for use on buildings and ledges, can also be used with support of GI wire and cable tie for firm installation support. 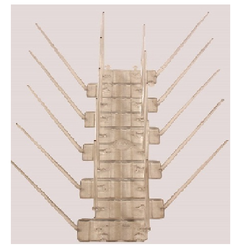 Bird Spikes 4 Row offered comprise 18 poly carbonate bird spikes in 4 row finish and come developed in ultra violet stabilized polycarbonate plastic that makes them easy to use and well as meet the demands of long lasting performance. Some of its features include allows for convenient installation on roof ledges, sign posts, statues and other areas; each piece of one feet in length, discourage birds from landing spots like sign posts, statues, roof ledges, building projections; provide for cost effective usage, offering assured results, allows easy installation on virtually any types of surfaces, each piece of one feet in length, 100% clear polycarbonate finish, sun and weather proof finish, non- Conductive plastic that does not interfere with electronic signals, break resistant and strong finish.